Author Topic: Cast or Electro form? I do think the spoon was well made and finished (buffed?). But the spoon may have been cast or possibly electro formed. See the red arrows below. 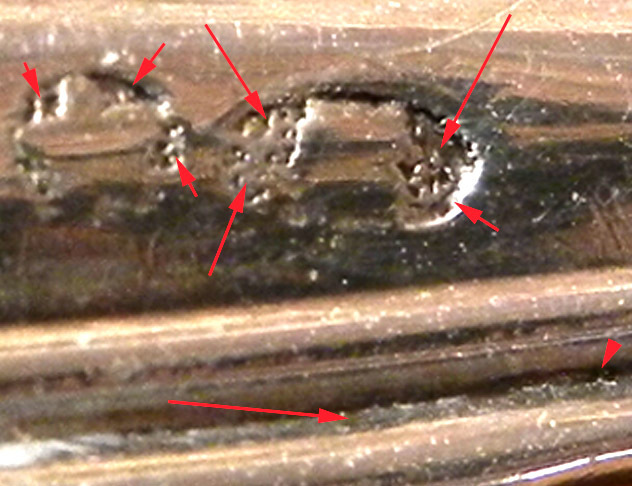 The arrows are pointing a texture in the recessed portions of the spoon which buffing would have had difficulty smoothing. The texture I see, I associate with casting or electro forming. Above are two more pictures of the same marks. It does seem that if the marks were stamped the background would be smooth and they clearly are not. Maybe we need other examples of Henry Hebbard’s marks to see if there was something in his dies that caused this. To me they look cast. Items I've seen that were electroformed seem to have much better detail. My very limited exposure to Electro forming says one side will be very detailed and one side more "textured". Not looking at the item first hand and not having more to compare it too makes it a hard comparison. I really don't know enough about Electro forming.... I've done a few minutes of Internet review and still remain in the dark about how one might Electro form an entire spoon.... Years ago my experience to Electro forming was being asked to authenticate a historic beaker. The outside of the beaker was pretty good but the polished inside showed the "texture". We were sure it was meant to deceive... The owner wasn't (they paid a lot). The next authenticator suggested the expense of X-ray spectroscopy which convinced the owner it wasn't in period silver. I'm leaning towards the platter spoon being a well made casting. Some examples of Elkington electroforming in the Met. That is interesting. I have always thought the casting process was used on figural type items or cut out sugar tongs and the like. If it was cast they used a mold that had built in marks and never buffed it. The French importation marks I think would rule out electroforming although I must admit I do not understand what that really is. I wonder if 3D printing will ever be used to make flatware. At the MET there is my favorite silver vase The Bryant Vase. It looks cast to me - those tiny bubble marks in the reserves of the hallmarks are the sort of thing I associate with casting. Electroforming seems to my eyes to give a much more refined and difficult to spot forgery. The way they are made is you take an original object, and make a wax or similar material cast of it so you wind up with a wax spoon that typically has very finely copied details from the original. Then you coat it with graphite or copper powder and electro plate it. You keep electroplating it until you have a layer thick enough to not fall apart then you melt the wax leaving just the shell of electroplated metal. Normally you make two halves of the object out of this electroplating process and then you put them together and fill them with a low melting point metal alloy. You clean it up then put a thin additional layer of electroplating on the outside to fully hide the seam. The result would typically be a much higher quality looking forgery than just a simple cast forgery. Especially since you are getting microscopic details in the electroforming and there is zero shrinkage that you otherwise get from pouring molten metal to make a cast copy. Electroforming has created really serious headaches in the coin collecting world as well as the rare military badges world since these forgeries are so good that they fool all but those experts who have the best detection equipment.